The Dune Lamp is Lisa's newest design. Sturdy stoneware construction with decorative porcelain overlay, and translucent blue water adds a dash of color. Solid brass fittings and custom reed shade made in the USA. Available in two heights. Dune Lamp, 23" tall, $395. 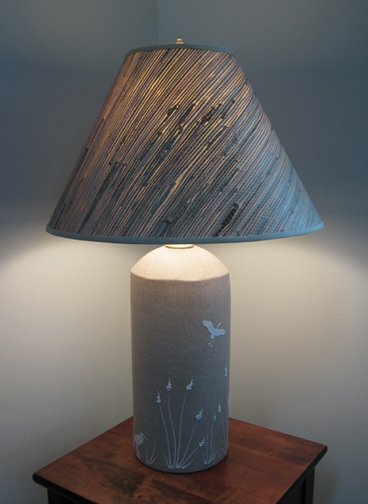 Dune Lamp, 25" tall, $425. 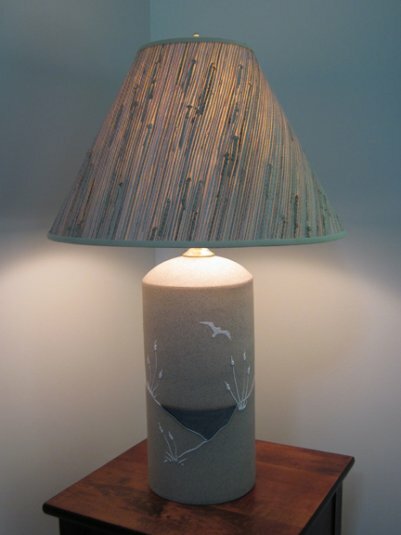 The Heron Lamp adds a serene focal point to any room. Sturdy stoneware construction with a decorative porcelain overlay. Solid brass fittings and custom made reed shade both made in the USA. Available in two heights. Heron Lamp, 23" tall, $375. Heron Lamp, 25" tall, $395. 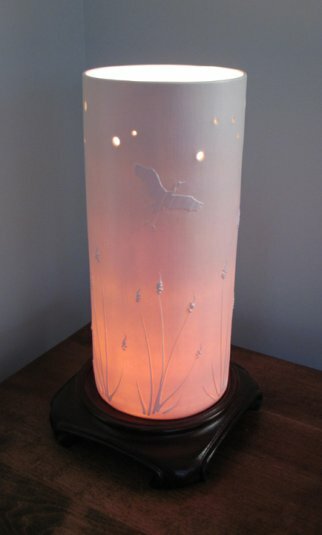 This handsome piece glows from within and adds serene beauty to any home. Useful as a night light too. A cylindar of porcelain is decorated on all sides with waving marsh grasses as a heron flies aloft. Stars glow in the sky and light is cast upwards from the open top. The mahogany finished wood base adds an architectural element, and the 8' cord assures ease of placement. This light takes a small socket bulb, which is included. Heron Lantern, 11" tall, $160.